After making all the heart blocks for the Wedding Quilt, I was left with a whole bunch of half-square triangles trimmed from the corners. The larger triangles come from the bases of the hearts, the smaller ones are from the top points of the hearts. 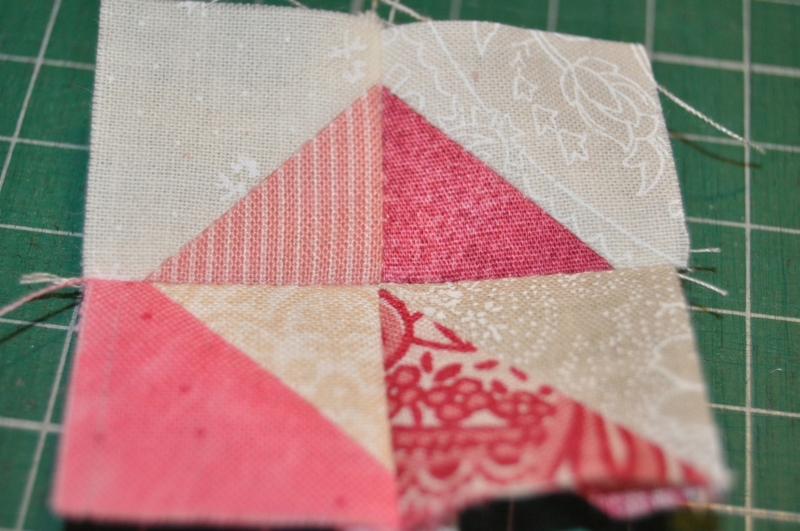 On a whim the other week, I started to chain-piece the larger triangles together. 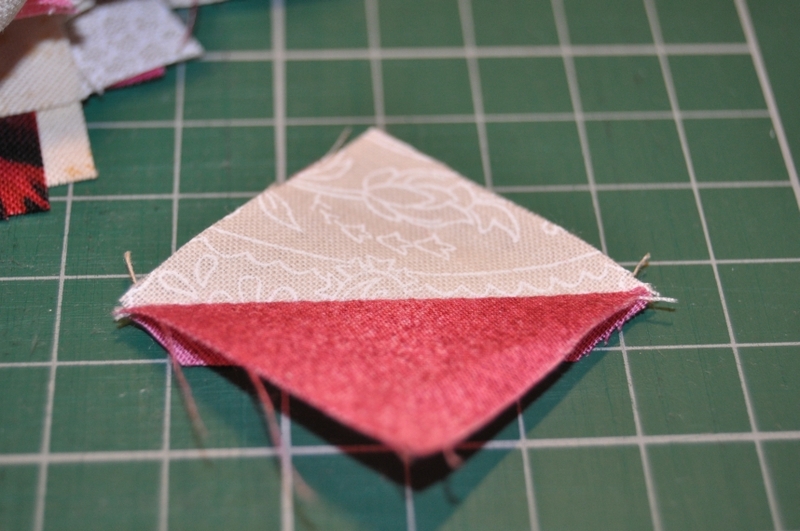 It’s quite a soothing and mindless task – plug in earphones, put on some tunes and just keep feeding triangles through the machine until the pile (or the bobbin thread!) runs out! 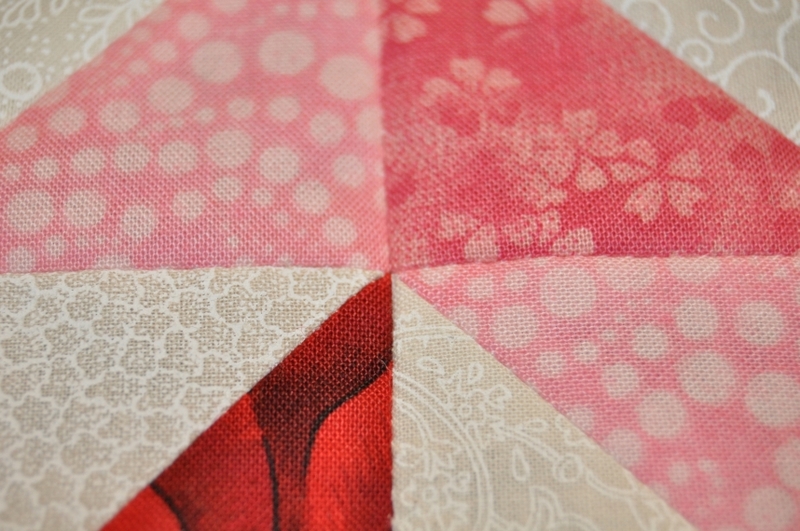 Once trimmed and pressed, the larger triangles made very nice 2.5″ squares: Pretty, no? After I did all the big ones, I decided to try the little ones, too. They’re a lot fiddlier and make squares of 1.25″. That’s a rather awkward size, though. The finished size of 0.75″ doesn’t fit very well with the finished size of the larger squares (2″). Still, that didn’t stop me sewing them ALL together anyway! The majority of them are still waiting to be trimmed and ironed. So, that’s nice. So what? As an aside, this is a project that made me appreciate the Pfaff SO much. Look at these points! Those tiny HSTs are adorable! 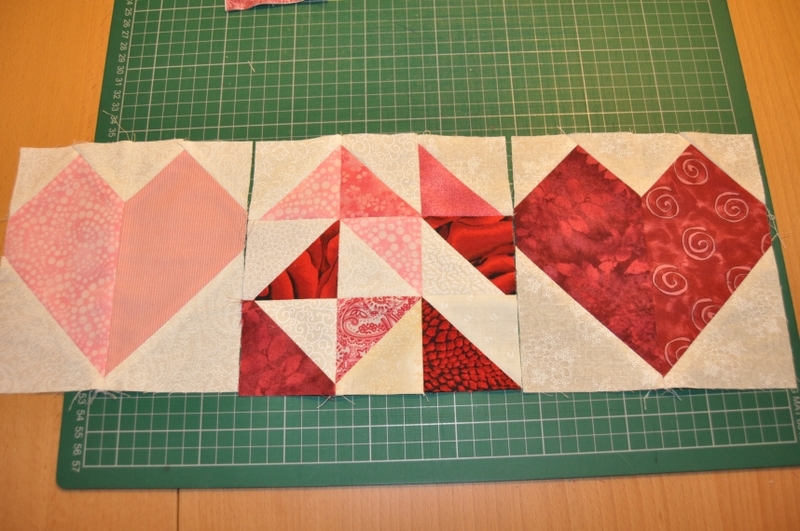 I am still trying to get my HSTs square and lined up perfectly. It is challenging sometimes! Thank you for your comment! 🙂 I really like those lil cuties too, though I’m waiting for another no-brain day to trim and press the rest of ’em! While I was making these, I discovered that it was *much* easier to trim these down before pressing them open. Because I was trimming two sides at once, it went much faster and gave good results. Thank you for commenting! 🙂 Yup, it’s lovely to have some switch-off time, isn’t it? I can be a bit control freak at times, so something like this is a real refresher. 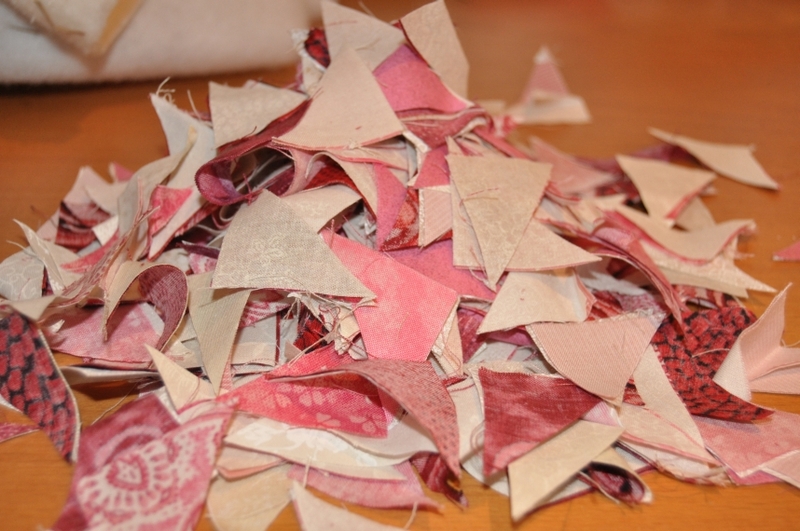 In fairness, I’d probably be more stumped if my scraps here were in a variety of colours, and would probably end up trying to marshal them into some sort of structure. Great scraps and blocks. I love it! A great use of “bonus” triangles. I sometimes use them as leaders-and-enders, though that eliminates the mindless break. 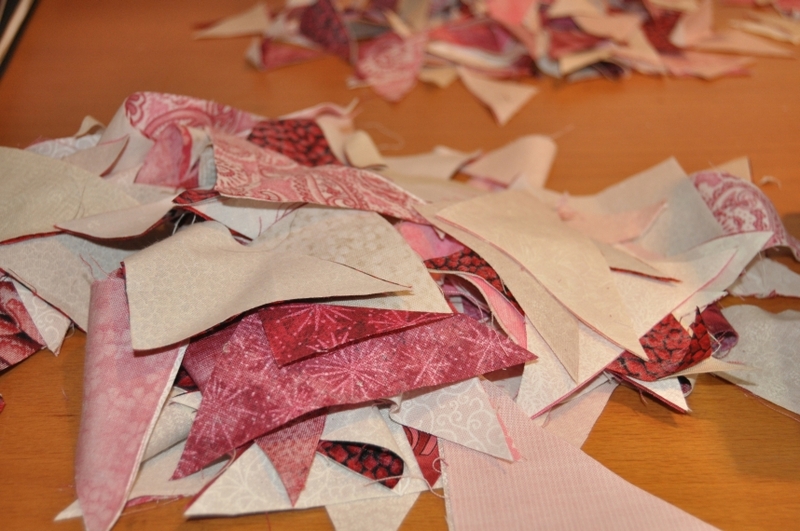 It is always nice to have scraps color coordinated because they come from the same main project. I love the arrangement where you combine them with the heart blocks. Maybe the tiny ones would make a sawtooth row. Thanks for your thoughts! I knew when I saw them that I couldn’t just waste them. 🙂 I’m fascinated by the idea of leader/ender projects, I only found out about them recently but haven’t been organised enough to try it yet. 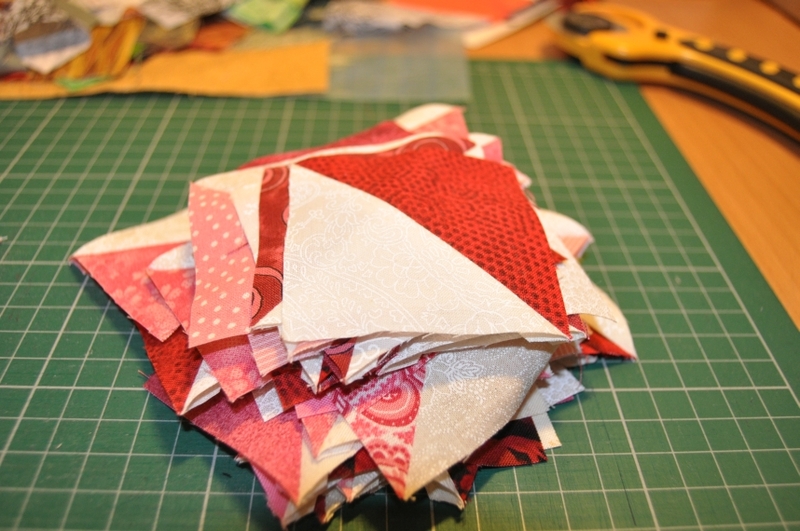 Totally agree about colour coordination, too – these are probably my most coordinated scraps, so I decided they were a good place to start. Those points are perfect! I am jealous. I like your relaxed approach. I think it really keeps things interesting. Thanks for sharing with Oh Scrap! Thank you! Most of the credit probably belongs to my sewing machine! XD The relaxed approach is a nice change for me; I’m usually quite control freak so it’s nice to switch that off now and again. 🙂 Thanks for hosting a lovely link-up party! Looks like a great use for your scraps and other leftovers. It will be darling! Thank you! 🙂 The only difficulty now is concentrating on the things I *need* to finish before I do any more with these. Oooops!